Great film is an understatement. It won Oscars for best picture, best director, best actor, best actress, and best writing adaptation. There was a musical remake in 1956, called "You Can't Run Away From It",starring Jack Lemon, June Allyson, and the Scenicruiser. Here we go! I wanted to cite this example to you. 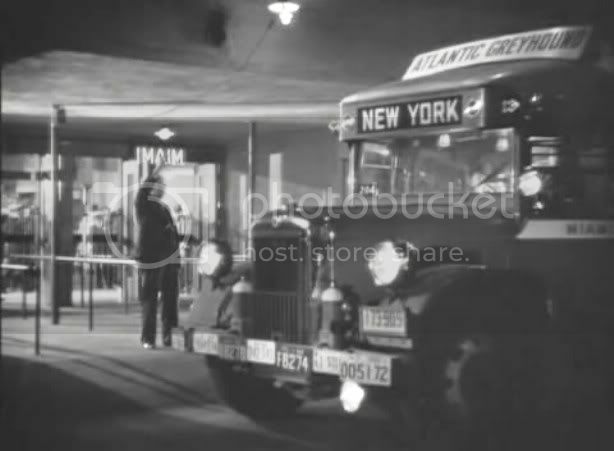 The film company had a great amount of cooperation from ATLANTIC GREYHOUND LINES. Keep in mind, this was just before ICC Regulation of routes! It is an important distinction. one had to change coaches for more distant travel. Let's just say in this case that you're words and I'm music! BTW; the New York plate is the phoniest I've ever seen! Thanks Mr. 'L' for those great photo's. 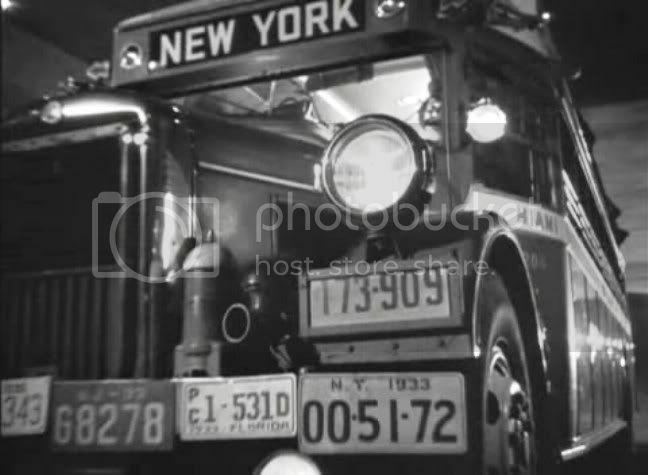 I remember there were scenes set at both Miami and Jacksonville with signs directing attention to the "Night Bus To New York". It may have been implied that Atlantic Greyhound ran all the way between those two points, but I doubt it. They probably pooled with Richmond Greyhound and Pennsylvania Greyhound, as well as at the time non-Greyhound affiliate Florida Motor Lines. The context of it? The film (and the stills from it, here) done sometime in 1933 (see IMDb for various notes). pleased to help in this effort (various notes are around on the point). Jacksonville segment, is the puzzle. on MIA - JAX segment? Unclear how this may fit, but GREYHOUND acquired PAN AMERICAN BUS LINES, which held NYC - Florida Authority. if you scroll about half-way down the page. There's a wealth of other history and photo's on this site as well. PAN AMERICAN? So, we are dealing with "a mess" here? <G> In the Jackson work, the line is not listed in the Index. He may have overlooked it. IIRC, I thought he had some brief mention within text of one of the Chapters. the ATLANTIC coaches went thru to MIAMI. authority of more than one GREYHOUND line on a particular pair of points. Yelloway System - Pioneer Stages, who bragged about being the first, single company operated coast-to-coast service in the late 1920's. They, along with others like Pickwick Stages eventually were acquired by Greyhound. Then there was All-American, a cut-rate transcontinental company that also went coast-to-coast. Eventually it morphed into American Buslines, a mainstream carrier that became a Trailways member after its purchase of Burlington Trailwaya from the railroad, and was eventually purchased itself by Continental Trailways. GREYHOUND discussions must have put a stop to that. When it comes to "Hollywood", 'poetic license' is liberally used. Ever seen the comedy, "The Big Bus"? It portrayed an gigantic experimental bus on its 'maiden trip' from New York to Denver. One of many gross inaccuracies was the bus negotiating mountain roads on its approach to Denver. Coming from the East into Denver is as flat as Kansas. were simply absurdites. The most ignorant think the latter states the N C L issues. provided UP, ESPEE or PICKWICK units. More. What of the scene at JACKSONVILLE? Are we to believe it was a painfully accurate replica on a Hollywood stage set? I don't know. Stranger things have happened in movie production. Then, not to forget contemporary film, "Fugitive Lovers" (1934), and now hard to find, tho it gets occasional run on TCM. It very much featured PENNSYVLVANIA GREYHOUND, comparable YELLOW COACH product. required, California sticker in the windshield? I agree with your assessment. It is highly unlikely that Atlantic sent buses to Hollwood for the production. Surely they would have used Pacific Greyhound equipment. The answer might be a combination. Filmakers (especially lower budget televison shows), will often send film crews to locations like New York City, for scene shots, but will do the lion's share of the production on the sound stage. in a Land Faraway. As a practical matter, likely it was "up the street" from one of the filming sites (noted in IMDb). high mountains, or desert like terrain in background. based at NAVY YARD, Washington, with many in field investigations into NORFOLK NAVY. Such is not actually the case. Most all of it filmed in LAX, Long Beach and San Diego.